For other uses, see Larva (disambiguation). The larva's appearance is generally very different from the adult form (e.g. caterpillars and butterflies). A larva often has unique structures and organs that do not occur in the adult form. Their diet may also be considerably different. Some larvae are dependent on adults to feed them. In many eusocial Hymenoptera species, the larvae are fed by female workers. In Ropalidia marginata (a paper wasp) the males are also capable of feeding larvae but they are much less efficient, spending more time and getting less food to the larvae. The larvae of some species (for example, some newts) can become pubescent and do not develop further into the adult form. This is a type of neoteny. 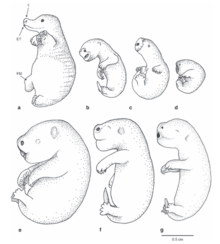 Mammalian larvae: Echidna "puggle" (a) and Virginia Opossum (b), Gray short-tailed opossum (c), Eastern quoll (d), Koala (e), Brushtail possum (f) and Southern brown bandicoot (g) "joeys". Apodous larvae - no legs at all and are poorly sclerotized. Based on sclerotization, three apodous forms are recognized. Eucephalous - with well sclerotized head capsule. Found in Nematocera, Buprestidae and Cerambycidae families. Hemicephalus - with a reduced head capsule, retractable in to the thorax. Found in Tipulidae and Brachycera families. Protopod larvae - larva have many different forms and often unlike a normal insect form. They hatch from eggs which contains very little yolk. Ex. first instar larvae of parasitic hymenoptera. Polypod larvae - also known as eruciform larvae, these larva have abdominal prolegs, in addition to usual thoracic legs. They poorly sclerotized and relatively inactive. They live in close contact with the food. Best example is caterpillars of lepidopterans. Campodeiform - well sclerotized, dorso-ventrally flattened body. Usually long legged predators with prognathos mouthparts. (lacewing, trichopterans, mayflies and some coleopterans). Scarabeiform - poorly sclerotized, flat thorax and abdomen. Usually short legged and inactive burrowing forms. (Scarabaeoidea and other coleopterans). ↑ Sen, R; Gadagkar, R (2006). "Males of the social wasp Ropalidia marginata can feed larvae, given an opportunity". Animal Behavior. 71: 345–350. doi:10.1016/j.anbehav.2005.04.022. ↑ Moore, R.C. (1959). Arthropoda I - Arthropoda General Features, Proarthropoda, Euarthropoda General Features, Trilobitomorpha. Treatise on Invertebrate Paleontology. Part O. Boulder, Colorado/Lawrence, Kansas: Geological Society of America/University of Kansas Press. pp. O121, O122, O125. ISBN 0-8137-3015-5. ↑ "Recognizing Insect Larval Types". University of Kentucky. Retrieved 28 April 2016. ↑ "Insect Larval Forms". About.com. Retrieved 28 April 2016. ↑ "Types of Insect Larva". Agri info. Retrieved 28 April 2016. Thyssen, P.J. (2010). Keys for Identification of Immature Insects. In: Amendt, J. et al. (ed.). Current Concepts in Forensic Entomology, chapter 2, pp. 25-42. Springer: Dordrecht, .